Released on: SPV/Steamhammer Release Date: Available now. So here we have the latest release from classic British melodic rockers, Magnum. ‘On The 13th Day’ is the band’s seventeenth studio release, in their lengthy career started officially in 1972, although I really only became aware of their fine work in 1978, which makes sense, as they only released their official first album ‘Kingdom of Madness,’ that year, in 1979, I picked up both ‘Magnum 2’ and the live ‘Marauder,’ yet still did not get to see the band live for the first time, until 1980 when I saw them twice live, the first time as special guests to Def Leppard on their first headline tour – ‘On Through the Night.’ – and then at 1980’s Reading Rock Festival. The band very soon became a staple on the UK gig circuit and I made a point of seeing them every year they toured. A very unique and special band. All through the 80’s - certainly in the UK - the band went from strength to strength and kept it going into the 90’s until ’95, when leading and founding member Tony Clarkin decided to call time on Magnum. He and fellow founding member, lead singer Bob Catley formed Hard Rain, trying to be perhaps a little more mainstream, but clearly there were heavy Magnum touches. Ed’s note: Hard to avoid when Tony Clarkin writes and produces most if not all of the material! In late 2001 they reformed Magnum with long time Magnum keyboard wizard Mark Stanway, bassist Al Barrow (Hard Rain) and drummer Harry James (Thunder) and this is the same line up today. 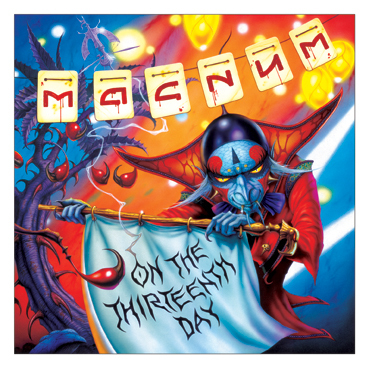 Since reforming Magnum, including ‘On the 13th Day,’ they have released six studio releases, so as of right now it does not look like they are letting up any! ‘All The Dreamers’ opens the album, building up from a very light, atmospheric and gentle intro, accompanied by Bob Catley humming and ‘wooo wooing’ and 'wooah wooah's' and then it kicks in well. Not fast, just a steady paced number. It’s such a wonderfully epic track, classic Magnum through and through without a shadow of a doubt. Great riffs, great hooks and terrific vocals from Bob Catley! I really can’t say enough about how great this track is, it’s perfect Magnum! Then ‘Blood Red Laughter’ brings back fond memories too of the likes of ‘Just Like An Arrow,’ 'All England's Eyes,' ‘Start Talking Love,’ ‘Lonely Night’ or ‘How Far Jerusalem’ even, it’s so, so strong, once again hook laden riff, strong melodic verses and chorus. Again, can they do no wrong?! Title track ‘On the 13th Day’ is next and ha, it’s almost an ‘Eye of the Tiger’ start! ‘So Let It Rain’ is next, which starts with piano and vocal only and then builds on that and once again this a really strong track and if I was completely honest it kind of sounds a little like a punchier ELO, with its overall song presentation. Magnum really have got back on track to a sound that I know for sure, fans of the older more classic Magnum song style – Think ‘ ... Storytellers ...,’ ‘Vigilante,’ ‘Wings of Heaven,’ ‘Breath of Life’ or even ‘Brand New Morning’ to some extent. – and I for one am really, really enjoying it! Again, I only wish I could see them live again. ‘Dance of the Black Tattoo,’ starts with some really dark and heavy riffs, holy …, I’m thinking Metallica! Seems quite strange hearing Magnum doing this, then the pre-chorus picks up some from the darker verses, then into the chorus it’s more in keeping with up tempo Magnum rockers, but overall this is quite a new path for Magnum to me. It’s fresh for the band, that’s cool to me. With ‘Shadow Town’ it’s funny as it’s a driving riff, yet nowhere near as heavy as the previous track, once more it’s classic Magnum and Tony Clarkin has really done himself proud here, this is such a strong album. Wonderful hooks and it’s just such a great song! The huge ballad that is ‘Putting Things in Place’ is next and this is where Bob Catley excels as his vocals with Mark Stanway’s simple piano and loads of strings too, with an easy going bass and drum track and power chords in all the right places sell the song well. ‘Broken Promises’ next starts with a guitar riff, that if played a little heavier could be Def Leppard, Bob Catley sings along with this until wham! It then drives almost AC/DC like and briefly eases back and it almost sounds like it wouldn’t be out of place on say Def Leppard’s ‘High and Dry’ album! Yes, it really is that strong and some great lead work from Clarkin and Bob Catley of course does the song proud. Great stuff indeed in my books! Thank you Magnum for some seriously fantastic new music! There really is a certain new edginess to a lot of the material here, without losing any of the band classic style and with ‘See How They Fall’ they keep this going. Simple repeated yet punchy chords can make for such strong song structures and Tony Clarkin knows how to do that oh so well, yet there’s so much more going on in every Magnum song and on this track, a surprising little flurry of upfront keyboard work appears. I often wish, from what Magnum fans of old will know all too well, that Mark Stanway could get more ‘highlighted’ moments. I certainly think the guy has more than shown, that he can be up there with the like of Geoff Downes (Asia) in the past, but generally in recent times, he’s really not as prominent as he could be. Don’t get me wrong, the man contributes great style to every Magnum album, but I just know he could add a lot more, if only given the room to do so. ‘From Within’ closes the album and it’s really a steady mid paced number that raises it’s game in the chorus as any good song should, perhaps a little laid back as an album closer, but still a very nice track. Complaints? None! I know what I just said about Mark Stanway’s input, but that does not mean that there’s anything wrong with this release. This really is a wonderful release from Magnum, best in years for me for sure, I love it.